Well, the www.facebook.com/stromberg97 Monster Give-away ended with its final winner today. 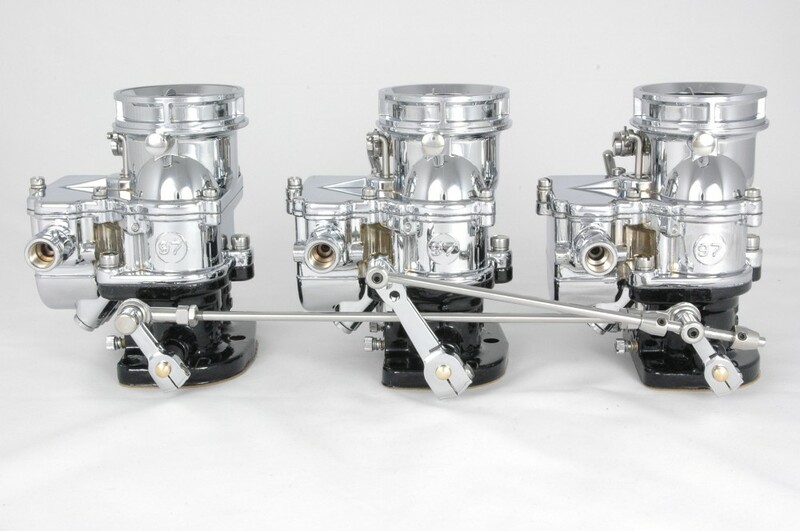 Chris Swenson out of Spokane Washington, USA just won THREE NEW STROMBERG 97 CARBURETORS of his choice. Regular, Chrome, Barn Find, Black, Orange, like the cool three we just made (above)? You name it. He was number 603 out of 1000, chosen by website www.random.org, just as we promised. We hope to post new pictures of the carbs in place at some time in the future. Huge thanks to everyone who went to the trouble to Like Stromberg97 on Facebook. Sorry you couldn’t all win. We also gave away 20 License plate frames, T-shirts, caps, signs and more , of course, so there were around 30 winners in all. And the Likes keep coming in too. Over 1030 at last count at www.facebook.com/stromberg97 and gaining every day. Please keep tuning in. Thanks! 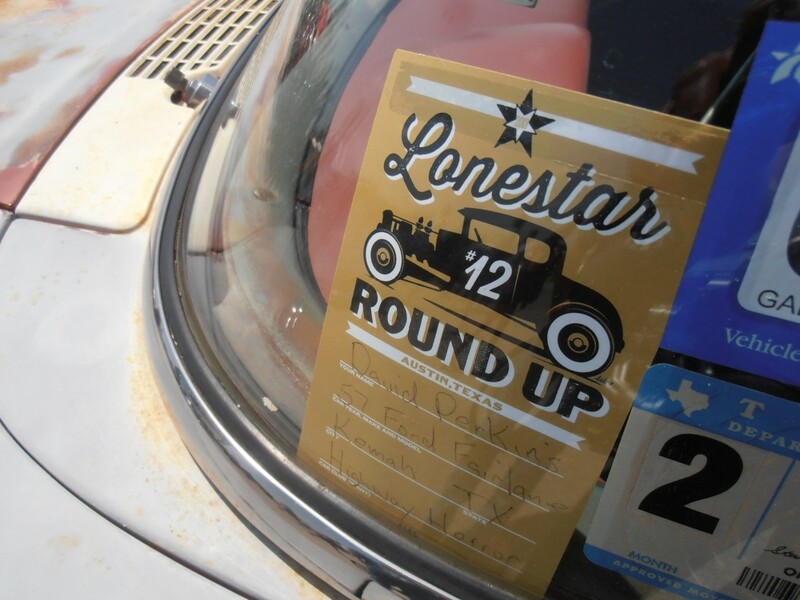 Given how much we enjoyed Round Up 2012, it would have been foolish to have missed 2013. Was there was any deja vu after last year? Not a bit of it. In fact, the more we visit Austin, the more we know our way around, the more we discover. 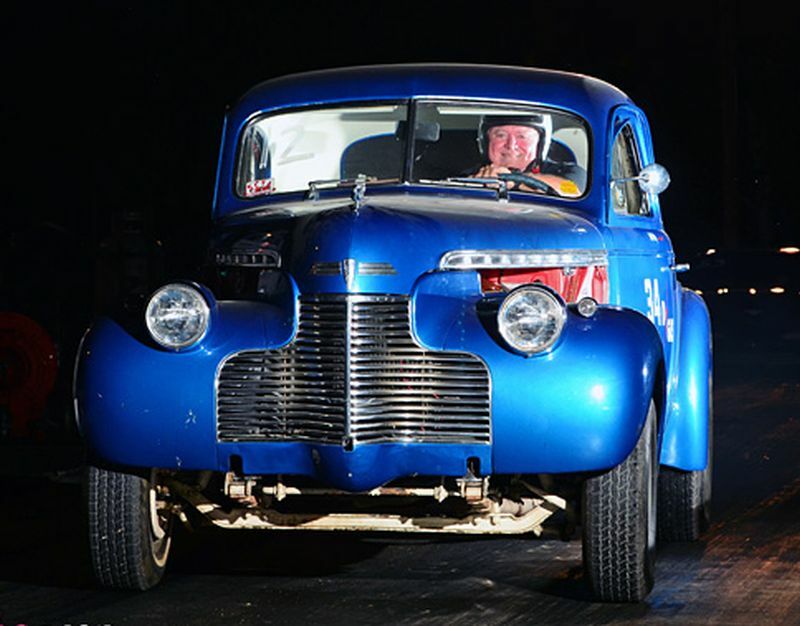 Best of all, we get a chance to meet all our buddies and recharge the old hot rod enthusiasm batteries. With a Thursday evening open house at Steve Wertheimer’s newly acquired garage on South First, Friday and Saturday at the Expo, evenings on South Congress watching the cars go by, the Austin Speed Shop party, Sunday’s cruise out to Ski Shores and a motorhome trip out for barbecue at the famous Salt Lick – thanks to Steve for the rides – we certainly did it all and saw it all. Here are just a few of the things we saw. Not so much the cars (which you can see in coverage elsewhere), but mostly just some details we liked. We posted more on our page at www.facebook.com/stromberg97 Thanks, of course, to everyone who showed us awesome hospitality, as ever. Next year’s dates will be April 4th & 5th, 2014. Synchronise your watches…. So…we hit 500 Facebook Likes! 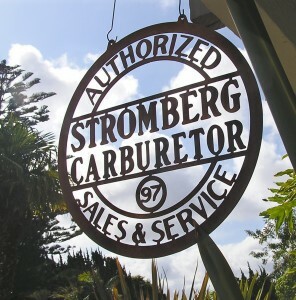 Someone has won our coolest sign – the Stromberg 97 Sales & Service rusty lazer-cut sign. $99.95 worth to be exact. And the winner is….Nick Hooks from New York. Please contact us so we can get it to you. 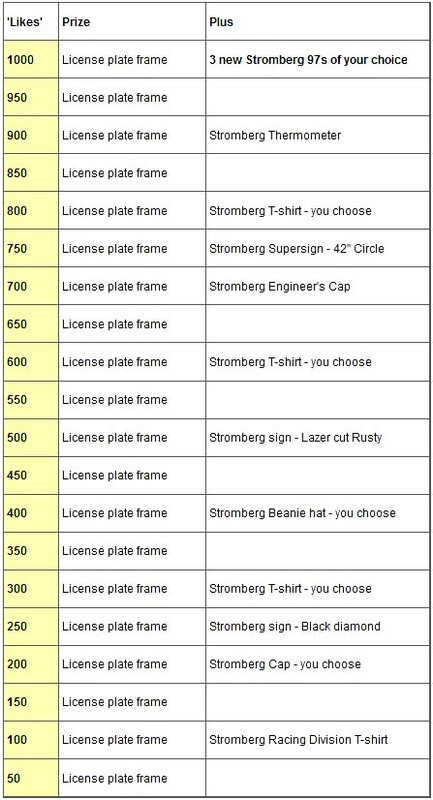 PLUS, if your name is Stefan Hokuf you just won a Stromberg License Plate Frame. Tell us your address, guys and stay tuned for more Prize Draws. 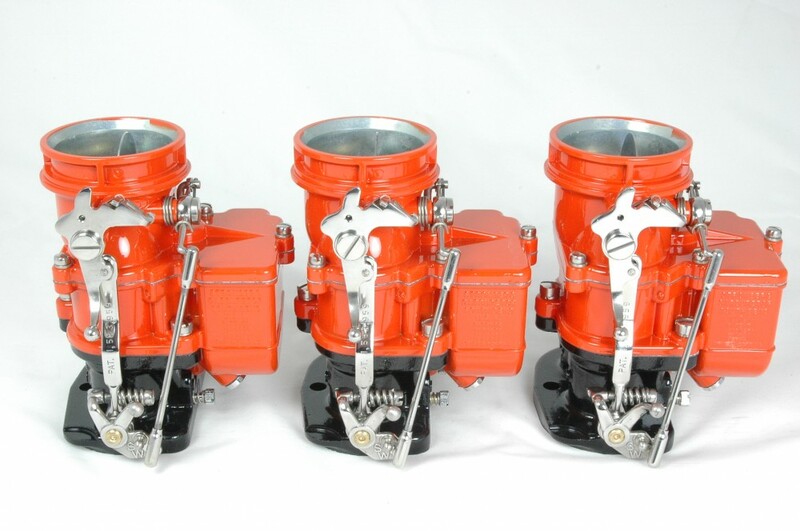 WIN THESE THREE NEW STROMBERG 97s! LIKE US ON FACEBOOK !! Here’s a thing. As I write this we have nearly 2000 people on our e-mailing list. Over 800 followers on twitter. 1000s of page views every month on our blog, the Stromberg Bulletin. But just 153 Likes on Facebook. We appreciate that support, of course. But it’s time to make some new friends. How? Bribery, that’s how. We’re giving away a load of Free Stuff. Stromberg license plate frames, signs, T-shirts, caps, beanies and yes, three new Stromberg 97s of your choice – even chrome. Here’s how we’re going to shake it down. We’ve set targets up to 1000 Likes on the Stromberg97 Facebook page, each matched with great free draw prizes. Every Like has a number, from Robin Larripa (1, our first ever Facebook Like). www.random.org is where we’ll pick our winning numbers. And if your number is drawn, we’ll ship the prize to you anywhere in the world. The license frame winners are drawn from the most recent 50 Likes (eg, 1-50 or 101 to 150) and the other prizes are drawn from all our Likes so far. Prize winners will be announced on Facebook and Twitter, and you have 14 days to contact us with you choice/shipping address. If we don’t hear from you, we’ll redraw and so on. So…Tell your hot rod & custom friends to LIKE us! The sooner we hit 1000, the sooner someone’s going to win three new 97s… And it could be YOU! Just one more thing. We’re already at 153 Likes if you’re these ladies and gents, please contact us soon to claim your prizes. CONGRATS.